Nothing is more holiday to me than sweet roasted nuts. These sweet and sticky almonds are too good and quite addictive. 1. Preheat oven to 325°. Spread almonds over a baking sheet in a single layer. Bake at 325°, or until fragrant. 2. Add honey, oil and salt to a large skillet. Heat over medium heat until the mixture starts to bubble. Whisk well. Add nuts and cook over medium-low heat for 3 – 4 minutes. 3. Add almonds and honey to a large mixing bowl and add raw sugar, toss to coat. 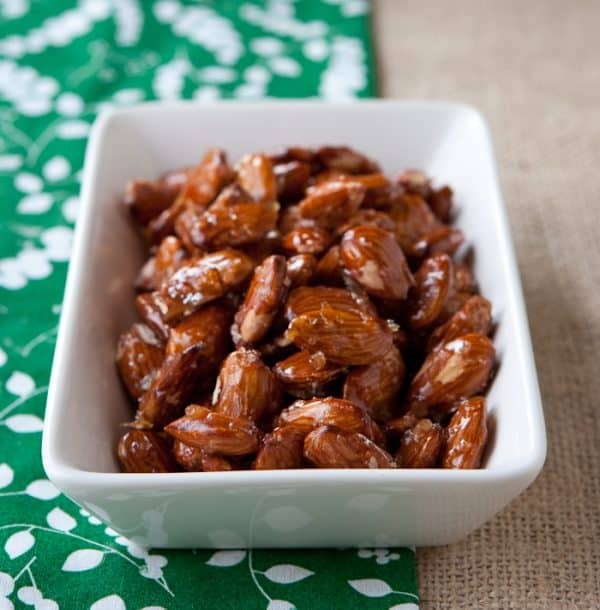 Spread almonds over a cookie sheet lined with aluminum foil in a single layer. 4. Let cool completely and break apart.